The Lhasa Apso joined the ranks of the Tibetan Mastiff, Saluki and Basenji, with the general membership’s approval to expand the gene pool outside the existing AKC registered dogs by incorporating region-of-origin dogs. In August 2011 seventeen dogs from the Gomp a Lhasa Apso Preservation Program entered the AKC studbook. Additionally, ALAC has continued use of AKC’s FSS® (Foundation Stock Service®) for region-of-origin Lhasa Apsos - whether they come from the actual geographical area where the breed originated or from another country that does not have a reciprocal registry with the AKC. * A completed AKC FSS® Recordation Application Form. * Copies of import/export documentation (if imported). * Copy of DNA profile. * Copy of microchip identification. * A pedigree, if available, extended as far back as known. * Copies of any and all registration certificates. Submit the foregoing, along with any other documentation that helps establish the dog as a pure-bred Lhasa Apso, to the NS Registrar. Once the completed AKC FSS® Recordation Application, photographs and required documentation are received by the NS Registrar, the dog will be assigned a Critique Case Number (CCN). The owner will be informed of the CCN along with scheduled dates and locations at which the Lhasa Apso may be presented for critiquing by a panel of three pre-qualified Critique Judges. If no timely critiques are scheduled in a location readily accessible to the Lhasa Apso owner, the NS Registrar will provide the owner of the Lhasa Apso with a list of qualified Critique Judges who may independently critique the Lhasa Apso and send the completed Critique Forms directly to the NS Registrar. All dogs that undergo the Critique Process will receive a CCN. This information will be kept by the NS Registrar. If a dog is considered not to be a pure-bred Lhasa Apso, it will be recorded with the word "Rejected" as a suffix to its CCN (CCN# -REJECTED). Upon receipt of three Critique Forms, all judging the dog to be a pure-bred Lhasa Apso and receipt of a check payable to AKC for FSS® Application, the NS Registrar will promptly forward the FSS® Application, photographs, supporting documents and a letter confirming that the Lhasa Apso has been found to be a pure-bred Lhasa Apso, to AKC FSS® for recordation. If at any time prior to the time that a full three generation has been produced and approved, any dog in any of the succeeding litters is judged by one or more Critique Judges not to be a pure-bred Lhasa Apso, then the NS Registrar promptly will notify AKC FSS® of such determination, and AKC FSS® promptly will cause the recordation of all dogs back to the original import to be cancelled. A Question of Generations - A visual explanation of the generations. 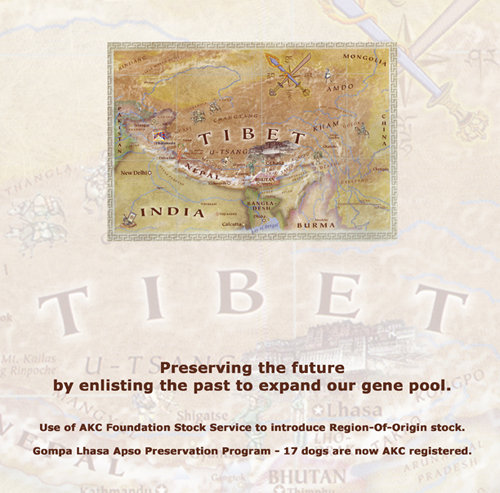 The Native Stock Registrar manages ALAC's continued use of AKC’s FSS®(Foundation Stock Service®) for region-of-origin Lhasa Apsos - whether they come from the actual geographical area where the breed originated or from another country that does not have a reciprocal registry with the AKC. This includes overseeing the Critique Process with all Lhasa Apsos in any generation to be recorded by FSS®.